President Recep Tayyip Erdoğan arrived in Moscow on Monday for his third meeting this year with Russian counterpart Vladimir Putin for the opening ceremony of the Turkey-Russia cross-cultural year. Opening the second part of talks in Moscow, with the participation of bilateral delegations, Putin said the two leaders agreed to further strengthen cooperation "in the spirit of advanced, multifaceted partnership." "I propose that we discuss specific areas of cooperation, the implementation of the most important joint projects, and outline guidelines for further expansion of mutually beneficial ties in the same businesslike and constructive manner with the participation of the governments," Putin said. Putin stressed that there was serious preparation for today's meeting of the Turkish-Russian High-Level Cooperation Council. Many contacts took place at all levels, and the heads of key ministries and departments compared the positions of the two countries within the framework of the special mechanisms of political, economic, and cultural interaction under the council, he said. The situation in Syria holds a particular place in the bilateral talks, he said. "I would like to note that Russia and Turkey, as guarantors of the Astana process, continue to make vigorous efforts for the long-term normalization of the situation in this country. "We are coordinating efforts to revitalize the Syrian political process, including with a view to forming a constitutional committee as soon as possible," Putin said. On economic ties, Putin said, "Much is being done to deepen economic ties, boost bilateral trade and investment flows." "Last year, the trade volume rose almost 16% to top $25 billion; the volume of mutual investments is approaching $20 billion," he added. "I believe the expansion of trade would be helped by lifting restrictions in this area, the diversification of the product range, the launch of new joint projects in industry, metallurgy, agriculture, and IT." Erdoğan said the two countries aim to further boost trade volume to around $100 billion. Putin said Russian-Turkish cooperation in the energy sector has acquired "a truly strategic character." "Russia is the largest supplier of natural gas to Turkey, and last year 24 billion cubic meters were exported to Turkey. This covers almost half of the country's needs," he explained. "The opening of a new gas pipeline, TurkStream, will significantly increase the supply of Russian gas to Turkish consumers." He added that this year the construction of a terminal on Turkey's Black Sea coast is expected to be completed. "Another strategic project is the construction of the Akkuyu nuclear plant in Turkey, with the launch of the first unit set for 2023. At this stage, it is necessary to attract additional funding and conclude an agreement with potential Turkish investors," Putin said. 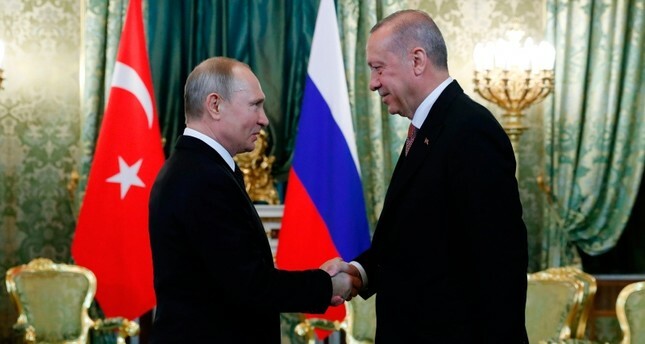 The Russian leader also touted military cooperation with Turkey, saying the delivery of the Russian S-400 air defense system to Turkey was discussed. Putin also praised personal and cultural bilateral ties. "I am sure that the cross-year of culture, which opens at today's ceremony at the Bolshoi Theatre, will contribute to the expansion of human exchanges," he said. Speaking at a news conference ahead of his departure from Istanbul for Moscow, Erdoğan said, "Our cooperation with Russia continues increasing and becomes stronger (day by day)." Turkish Presidency Communications Director Fahrettin Altun wrote on Twitter Monday that Turkey and Russia's "mutual commitment to working together and goodwill" supports bilateral relations and regional cooperation in all areas from security to the economy. Altun also stressed that Ankara and Moscow are taking all measures to ensure Syria's territorial integrity and fight against terrorism. "We urge all nations, which support terrorist groups that threaten our and Syria's territorial integrity, to reverse their course and to contribute to the ongoing process," he wrote. "Our approach to our defense cooperation with Russia covers a broad range of issues including the reciprocal purchase of military equipment and joint production. The defense industry represents, and will continue to represent, an important part of our bilateral relations," Altun concluded. The High-Level Cooperation Council meetings between Turkey and Russia have been held annually since 2010.